On Dec. 22nd, the Supreme Court of BC issued an order prohibiting Sunshine Coast Community Forests (SCCF) and its contractors from roadbuilding and logging in Blk EW28 -(The Chanterelle Forest) until Jan 2, 2018 when Madam Justice Warren will make a ruling on whether there should be an in injunction in place until the underlying lawsuit is heard. 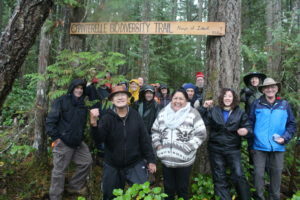 Madam Justice Warren will then decide whether the SCCF will be prohibited from logging the Chanterelle Forest until the judicial review is heard. While no date has been set for the judicial review yet, it is anticipated a hearing will be set in late Winter or early Spring 2018. Earlier in the week ELF made an application before the Courts to suspend or ‘quash’ the decision by the District Manager of the Sunshine Coast Natural Resource District of the Ministry of Forests, Lands & Natural Resources Operations to issue permits based on a ‘Breach of Procedural Fairness’. The Chanterelle Forest protection campaign by ELF has been ongoing for the last 4 years taking considerable effort. We remain hopeful that this key, low-elevation forest will finally receive the protection it deserves for multiple ecological reasons. Please consider supporting ELF with a small, medium or large donation to keep our fires burning into 2018. All monies raised go directly into local forest protection campaigns.